The insulating power of down is described by “fill power.” There are various national standards for measuring fill power, but they are all quite similar. In the United States, one ounce avoirdupois of down is fluffed up and its moisture content standardized by keeping it in a controlled humidity and temperature for a few days. It is then placed in a cylinder, shaken, and compressed with a lid of standardized mass. The number of cubic inches occupied by the settled down is its fill power, which is generally stated in increments of 50. The down is then severely compressed; within 72 hours it should spring back to the original volume. Downs differ in fill power because, among other factors, they come from different species of bird. The down clusters from geese are larger than those from ordinary ducks, for example, and so the fill power of goose down is typically greater than that of duck down (but not down from eider-ducks!). 400 Bottom end of bedding and sleeping bags. 500 Bedding, such as comforters. Uses where weight is not very important. 600 General purpose. High quality bedding. 700 Rare. High quality outdoor wear and sleeping bags. Not usually used in bedding. 800 Very rare. From geese coddled from egghood. Expensive sleeping bags and outdoor garments. 900 Extraordinarily rare. Very high quality sleeping bags and technical garments, typically for use in mountaineering, where both warmth and weight are of extreme importance. Very expensive. Sellers often specify how many ounces of down are in a garment or comforter. A higher number is better (warmer) only if one is comparing downs with the same fill power. Down is never all down clusters; some feathers are mixed in. The Federal Trade Commission formerly required that if you call it down it must consist of at least 70% down clusters, but this has been rescinded. In Canada, products labeled as containing “down” must contain at least 75% down clusters. The problem with this ratio as a figure of merit is that there is no easy way of measuring it: a sample of the down must be laboriously picked apart, cluster by cluster, sorted into piles and the piles weighed. Was the sample representative of the batch as a whole? 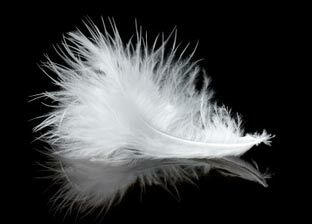 Then there is a legitimate question of whether each particular piece constitutes down or feather. As a result, you may not want to make a purchasing decision on the basis of a small difference in this ratio. The federal standard for down-proof cloth is 200 threads per inch, but with continued washing this often proves unsatisfactory. Prefer a higher thread count, preferably in a plain-weave fabric. Manufacturers test down-proofness by measuring air flow through the cloth. American Down Association. Sacramento, CA. ASTM D4524-86(1993) Standard Test Method for Composition of Plumage. Federal Standard No. 148a-1964 Method 2: Determination of Composition Feather Filling Materials. FTC Guides for the Feather and Down Products Industry, 1971. Last revised: 19 February 2004.